and they will have greater peace of mind when they are prepared. Our company has created a customizable family safety plan, making emergency preparedness easy and organized for everyone! We specialize in helping families become prepared with the Preparewell Family Safety Plan. 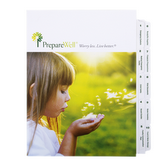 The concept of PrepareWell was created in the aftermath of the San Diego 2007 wild fires; PrepareWell brings Peace of Mind to thousands of families who recognize the need to be prepared, but don’t really know where or how to begin. The unique PrepareWell Family Safety Plan brings every aspect of emergency preparedness together in ONE PLACE. …and presents them in 10 Easy Steps, so you can create a Family Safety Plan customized to meet your family’s needs. We also offer the PrepareWell Family Safety Plan Gift Card, so you can give the gift of Peace of Mind to friends and family. This is great for holiday gift giving! Additionally with our great fundraising program, you now can "Prepare" to support your favorite organization... with the PrepareWell Family Safety Plan! Click here to visit PrepareWell's website. Watch our video and read our Member Benefits to learn more about how PrepareWell can benefit you. WIN: 24/7 MOMS and PrepareWell are giving away a Preparewell Family Safety Plan. * We received a complimentary Preparewell Family Safety Plan for review no financial compensation was received. I like Daily Mom Deals on FB. I liked Daily Mom Deals on Facebook. I'm a subscriber. These are neat!